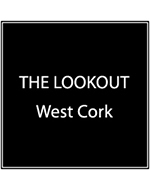 The Lookout provides a luxury private holiday experience for guests of all ages. It is suitable for a family beach holiday, sailing and surfing, walking, sightseeing, painting, golfing, birdwatching or even a working holiday due to the high-quality internet access and the space, peace and light. The stunning panoramic views of seven of the islands in the archipelago off the coast of Schull- plus the Fastnet lighthouse itself- make for an ever-changing landscape seen from all the rooms in the house. There is no traffic. Outdoor dining furniture on the several patios allows full appreciation of the islands by moonlight. There are 2 twin bedrooms upstairs and there is a master double bedroom downstairs, ensuite with own patio, separated from the rest of the house by a corridor/walk-in wardrobe lined with bookshelves, drawers and hanging wardrobes. The downstairs ensuite bathroom has a curved corner enclosed shower cubicle, toilet, sink, heated towel rail and cupboards with lit mirror. Upstairs there is a shower room with sink, and a separate room with toilet and sink. Downstairs there is also a guest toilet and sink. The house is extremely light, sunny, warm and spacious with large porch, inner hall and very large upper viewing landing with views of the lighthouse and the seven islands. On the landing there are scatter cushions and bean bags. Downstairs there is a snug/TV room which can double up as an occasional bedroom for small children. There is also a very large sitting room/breakfast room/kitchen downstairs, with French doors opening onto large patios surrounding the house, facing east, south and west. The kitchen and utility area are well-equipped and there is an American-Style fridge-freezer, dishwasher and tumbledryer. There are two televisions (one to watch Sky or Sky Sports TV and to play DVDs and the other to play children’s videos). There is a large range of DVDs and videos. There is generous private parking. The garage/games room with table tennis table is across a sheltered courtyard. There is an outdoor washing line and a tub to wash wetsuits. The garden is large with beautiful views and suitable for small children with no water hazards. Parents of toddlers should be aware of a small set of steps descending from the patio to the field, and parents of older children should be aware of the steep drop from the hillside above the garage to the area around the garage itself (this is protected by gorse and brambles and children are not generally attracted to the area). There is lots of space for ball games in the garden and field. Most rentals are Saturday to Saturday but we can be flexible about changeover dates, especially out of season and around bank holidays. We have many guests who rent the property every year, having originally been told about it by previous guests. Most of our rentals are by word of mouth recommendation.